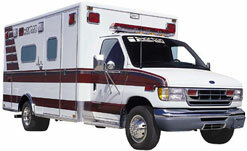 A top-of-the line ambulance with all the latest technology. Cheaper (or more expensive) models are also available. If you are interested in discussing donating an ambulance, please call our office at: 1-973-773-1884. Dedications can be customized on the outside and inside of the ambulance.